In an article published in the December 2nd issue of The Lancet, the authors address the “weaponisation of health care”, defined as the strategy of using people’s need for health care as a weapon against them by violently depriving them of it. 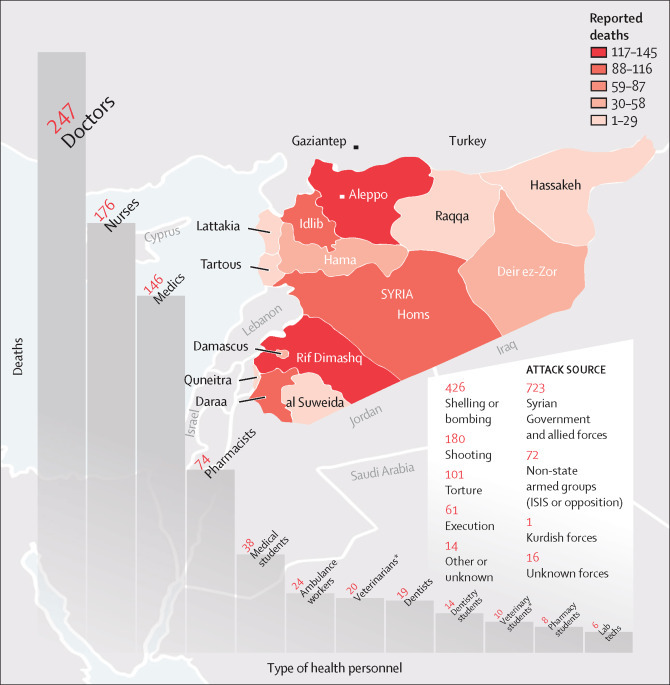 As a result of these attacks on health care, hundreds of health workers in Syria have been killed and hundreds more have been incarcerated or tortured. Evidence shows use of this strategy on an unprecedented scale by the Syrian Government and allied forces, in what human rights organisations described as a war-crime strategy, although all parties seem to have committed violations. Attacks on health care have sparked a large-scale exodus of experienced health workers. Formidable challenges face health workers who have stayed behind, and with no health care a major factor in the flight of refugees, the effect extends well beyond Syria. The international community has left these violations of international humanitarian and human rights law largely unanswered, despite their enormous consequences. There have been repudiated denunciations, but little action on bringing the perpetrators to justice. This inadequate response challenges the foundation of medical neutrality needed to sustain the operations of global health and humanitarian agencies in situations of armed conflict. In this Health Policy, we analyse the situation of health workers facing such systematic and serious violations of international humanitarian law. We describe the tremendous pressures that health workers have been under and continue to endure, and the remarkable resilience and resourcefulness they have displayed in response to this crisis. We propose policy imperatives to protect and support health workers working in armed conflict zones.